Fresh fruit, veggies and bread from the local market. My wonderful guests..thank you..I had a great time with you guys! ..there is soo much more! 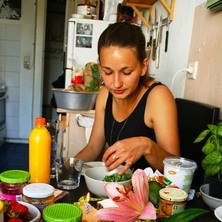 Hi Sofie, “Vegan Sunny Sunday Brunch” looks wonderful! I'll be in town for a few days and I'm wondering if you could host me. Thank you! Join me for a relaxed Sunday brunch in my cozy little kitchen! You will be spoiled with a variety of vegan breakfast treats like waffles, delicious vegan spreads, bread from the best bakery in town, endless fresh fruit and veggies from the market and of course gooooood coffee and fresh juices! My lovely roommates might join in on the fun! It was a very cozy and nice atmosphere. The food was prepared with great attention to detail and there was a huge variety of delicacies. Really very very tasty. Sofie was very friendly and an excellent host and the coffee was great :-) It was great a pleasure! Review of Vegan Burger Do-It-Yourself-Night!!! Sofie and his friends were great! I had an awesome time trying two versions of her vegie burgers and several other vegan ingredients for our meal. Most importantly, it was a great night: I had awesome conversations and met people I would only meet through meal sharing. Thanks Sofie! Sofie is a very great host and such a lovely person!! Everything she prepared for her sunday brunch was made with lots of love!!! I went to the market with Sofie to buy all these fresh and healthy looking fruits and vegetables she wanted to serve at the brunch. She prepared soo many nice things, i wished i could eat forever!! And she also turned her sleeping room into a very cozy dining room with a beautifully decorated table!! It is always a pleasure to share a meal with Sofie!! !